So last year I discovered a family of groundhogs living in the Kudzu vines at the end of a street near my house. Almost every time I stop at that particular stop sign, I see a fuzzy, brown head poking up to say hello. They're so cute and they make my day whenever I see them. Winter is fast approaching, and I'm seeing the groundhogs less and less. I don't know much about hibernation, but I imagine they're getting ready for their long sleep until Groundhog Day. Pretty soon I won't see them at all. It's odd how one silly, little thing can become part of your life. 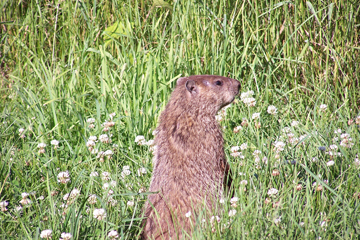 I think of them as "my" groundhogs, even though they're wild creatures living on the hill by an on ramp. I look for them every time I stop at the road. Worry about them when the city cuts the grass and trims the bushes along the road. Call to them to get off the edge of the road when they're so close it scares me they'll get run over (they never do). They even gave me a short story idea, and then a novel idea (though I have nothing beyond a title for that one. But it's a cool title and will make a funny book once I come up with a plot for it) They're like my fuzzy little muses. I look forward to spring when they pop back out of their holes and I see next year's babies out there with Mama. That'll be a good and happy day. Farewell my groundhogs. I'll miss you. Don't be sad. Imagine the joy you'll have on the first days of spring when nature rejoices and the Groundhogs celebrate rebirth. IJ, I am thinking about that. It'll be fun to see them and the new babies. And yes! I switched it over. I didn't realize comments was off. Which explains why no one ever commented.